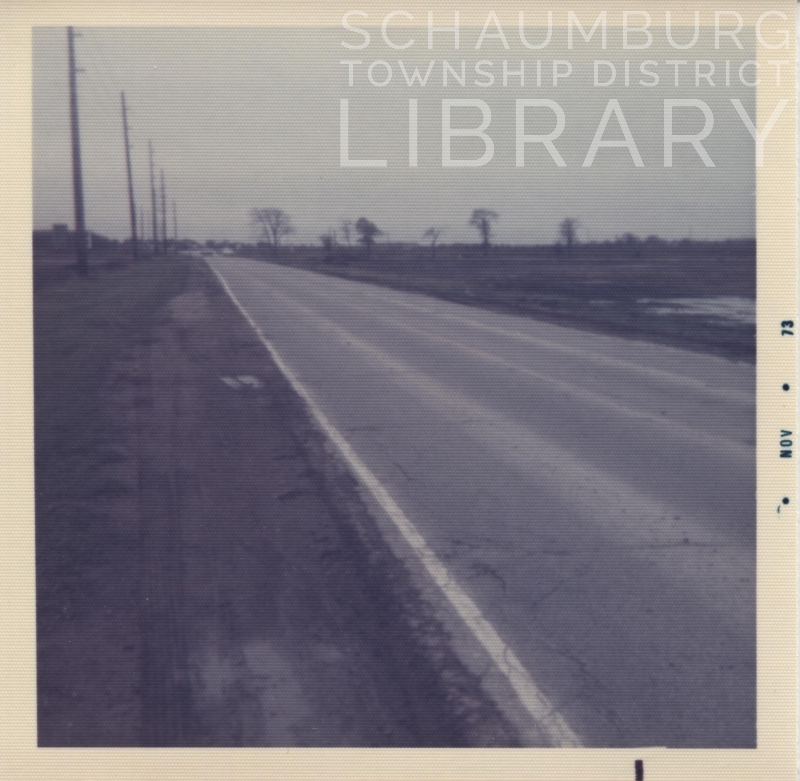 The Walter and Maybelle Ellis family moved to Schaumburg Township in 1955, just before the boom started. 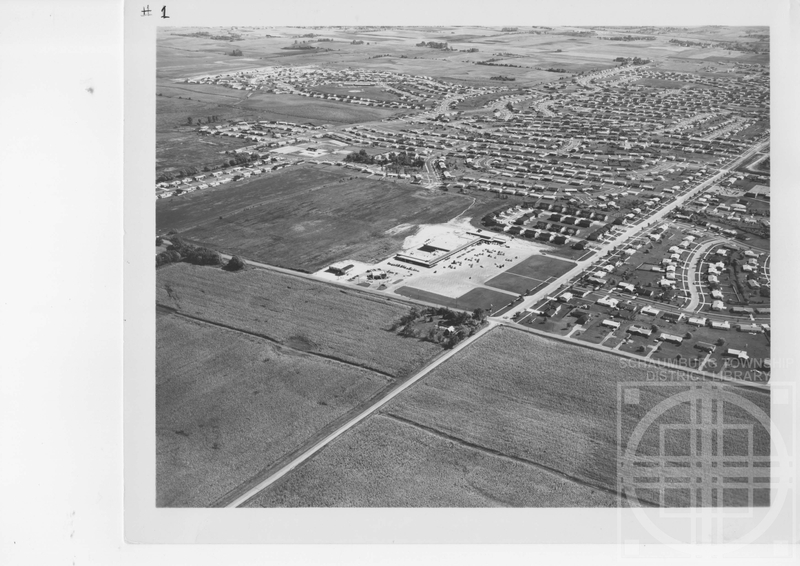 They, along with their daughters Jean (Mathew Helsper) and Betty (Melvin Helsper) bought property on the southwest corner of Schaumburg and Plum Grove Road from Palmer and Marge Carlson. The daughters had married two Helsper brothers and the families moved to the corner with the intent of living close together. Prior to building their homes, it was necessary to get approval from Cook County to have it dubbed the Helsper-Ellis Subdivision. 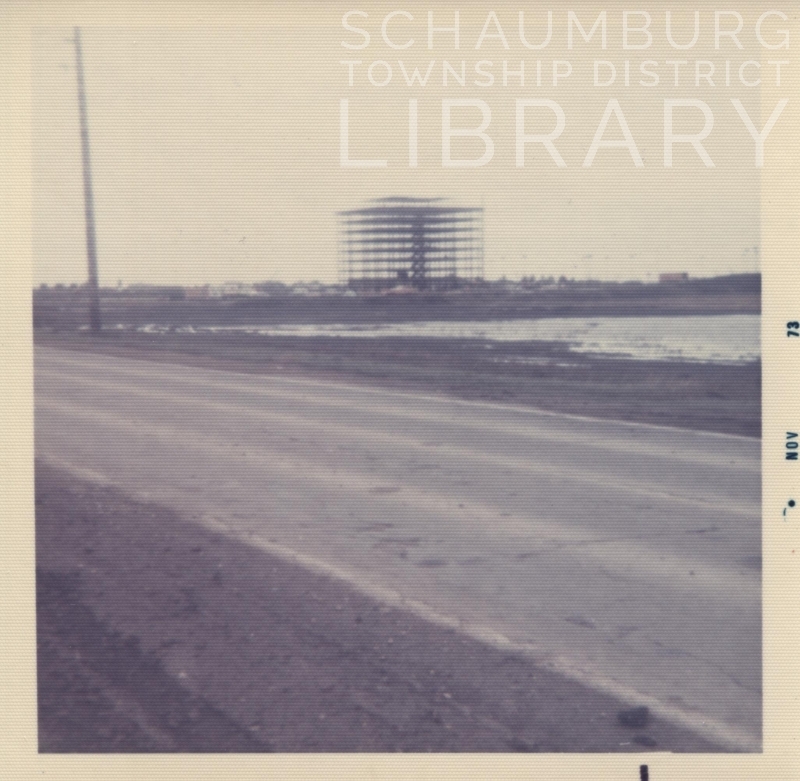 Once the homes were built, the families quickly became involved with the new village of Schaumburg. 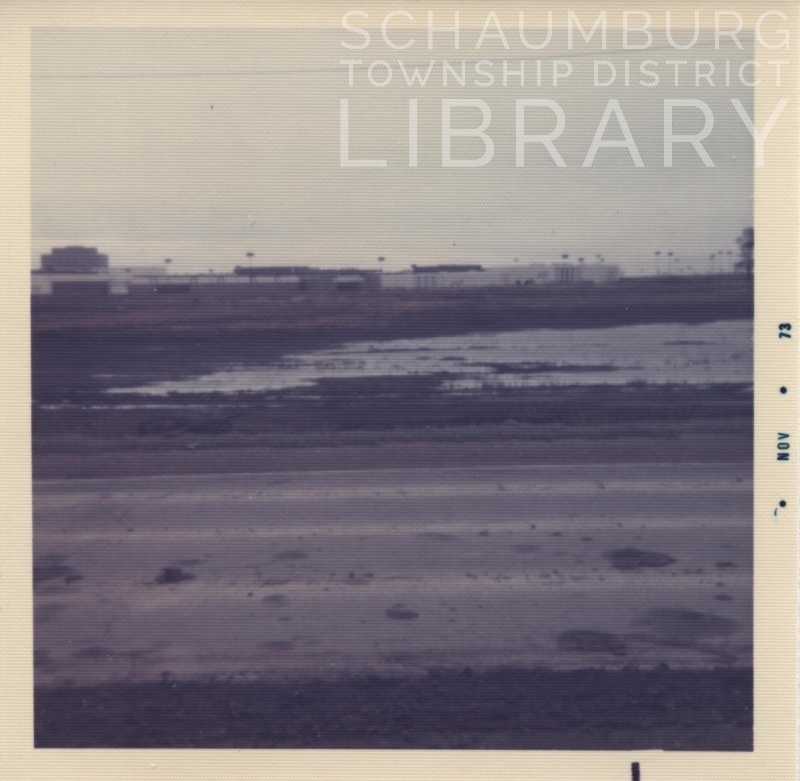 These photos are from the collection of Mathew Helsper who was Chairman of the Schaumburg Zoning Board and a trustee on the Village Board. They are a great overview–in more ways than one–of how the village evolved. The photo above shows the layout of the relatively new Weathersfield subdivision taking place. 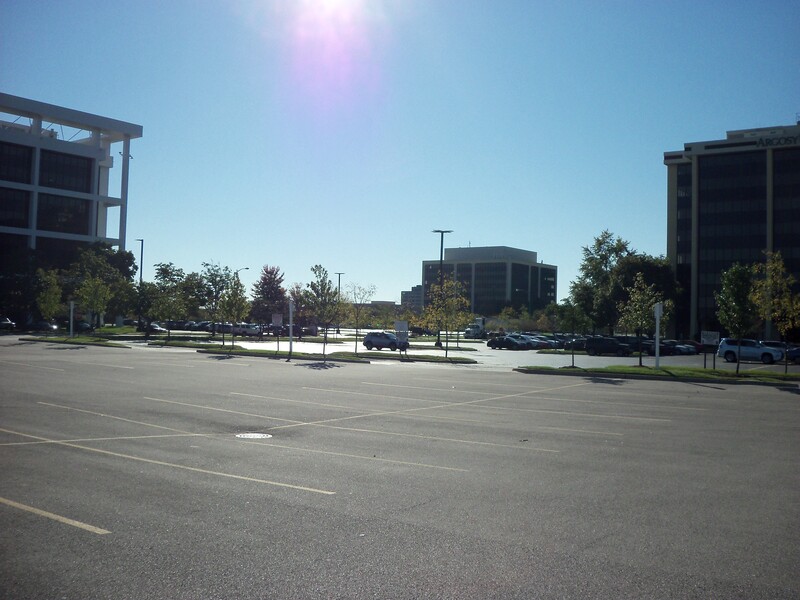 We are looking south from the intersection of Schaumburg and Springinsguth Road. The first homes are to the west (or right) of the intersection along Schaumburg Road. This is the “W” section where all of the streets start with that letter. 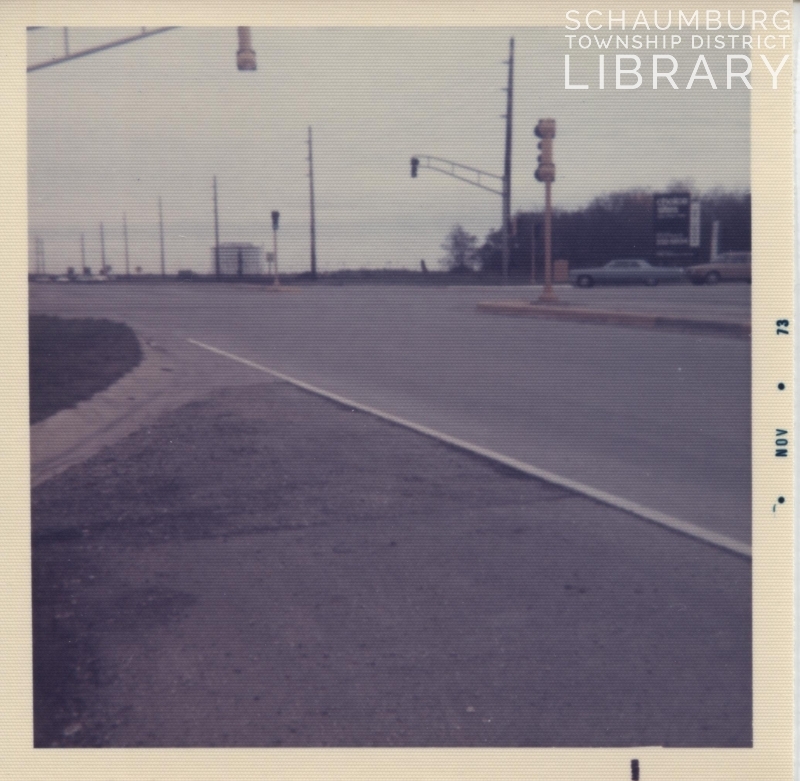 The model homes were on Schaumburg Road, next to the intersection. Notice how the homes are spread out and have larger lawns in this section. The big box on the southeast side of the intersection is the first Jewel grocery store in Schaumburg. Directly in front of the store is the Pure Oil gas station. To the left of that is Fire Station 1. 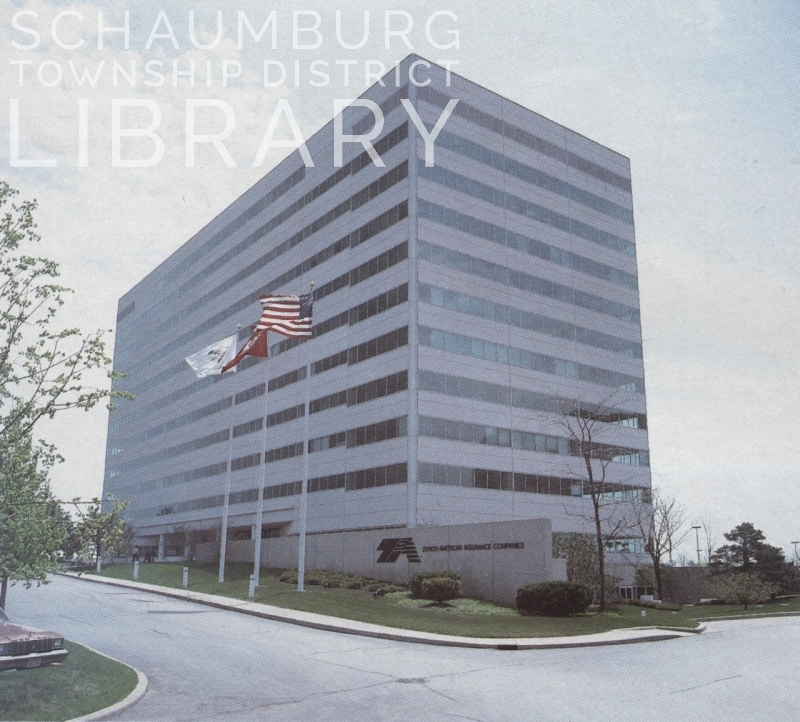 Both of these buildings are gone but the Jewel building is still a portion of the Weathersfield Commons shopping center even though Jewel itself has moved further west on Schaumburg Road. 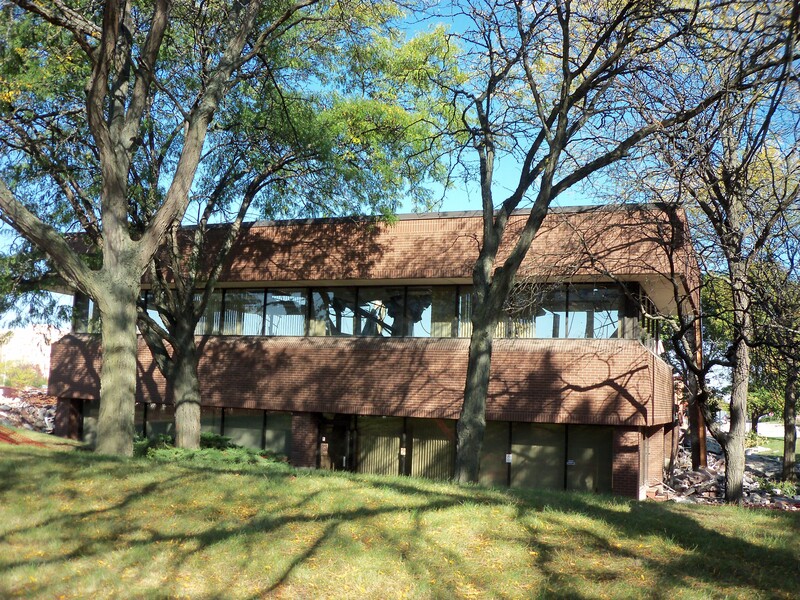 The house that is sheltered in trees on the north side of Schaumburg Road, was originally built by Mr. Ode D. Jennings, owner of The Barn property. Sometime before 1938, Mr. Jennings built the house for his cousin Everett, who served as his attorney. Miss Irma Fischer who was a secretary in Everett Fischer’s law firm also lived in the house. This house was later moved down Springinsguth Road to where it still stands today. There was another, smaller home on the property where Mr. Therman, Ode Jennings’ chauffeur lived. According to D. Nelson who grew up in the area, this property was eventually sold in the early 1950s to Eve Fasse after Everett Jennings and Miss Fischer passed away. The Barn property is in the middle of the photo, behind and to the left of the Jewel in a wooded glen. Bock Park is to the left of The Barn. Houses are already built along Standish Lane as it runs in a straight line from Schaumburg Road to Bock Park. Looking at this aerial view, it is possible to see how Weathersfield was built in 20 plus phases. In fact, you can make out the start of Weathersfield Way stretching towards the east. As land was purchased, new phases were planned and added to the existing development. Of course, prices went up too! The view of this photo is looking southwest at the Weathersfield subdivision from the area near Schaumburg High School. According to a reader of the blog, the timing is 1965-66 because Weathersfield Unit 5 appears to be completed. Everything from the photo above is also in this photo. 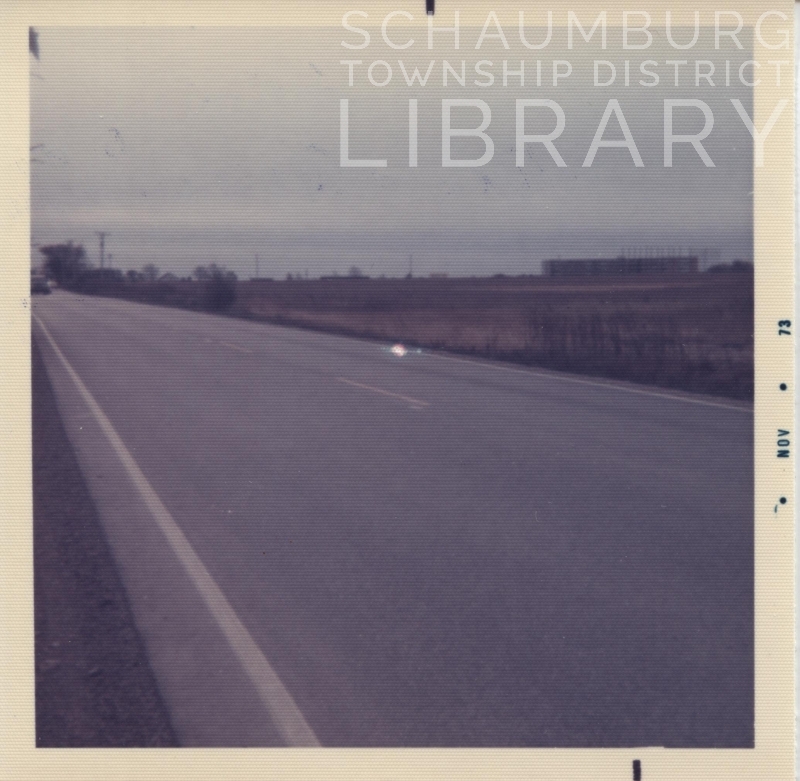 Schaumburg Road is the straight road running through the right side of the photo with Springinsguth Road being the other straight road running perpendicular to it through the subdivision. Springinsguth Road hits Wise Road, another straight road running east to west in the photo. Laid out neatly in a grid are parts of the Hanover Highlands subdivision, which can be seen in the upper middle of the photo. Irving Park Road runs at a curving angle through the middle of the photo. You can see the unincorporated Spring South subdivision between Wise and Irving Park. Also, notice the big pond on the left side of the photo. It is now encompassed by the Ruth McIntyre Conservation Area. Lake Street is also in the upper portion of the photo, running parallel to Irving Park Road. And, of course, Barrington Road bisects both of those roads through the entire upper portion. It clearly ends at Lake Street.The view of this photo is looking due north from Irving Park Road coming in at the angle to its intersection with Wise Road, just east of Barrington Road. The Milwaukee Road rail line is on the bottom of the photo. Bisecting it is Rodenburg Road. Where it hits Irving Park Road, you can see St. John Lutheran Church on the SE corner of the intersection. Due west of Rodenburg is Long Avenue. On the far left of the photo, just beyond the intersection of Irving Park and Wise is Hanover Highlands. Between Irving Park and Wise is the Spring South subdivision. North of Wise is the Weathersfield subdivision with the Nathan Hale School property on Wise looking like it’s being prepped for construction. Hale opened in 1969 so we can probably date this photo around 1967 or 1968. In the upper right portion of the photo is the very wooded area of Sarah’s Grove. Quite a dense patch of timber, isn’t it? Timbercrest subdivision is being developed to the south of the trees. 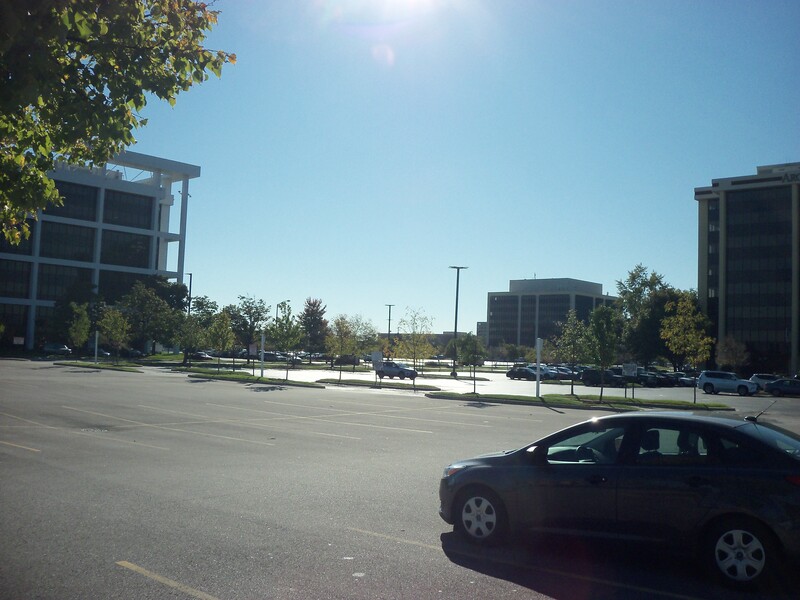 The various parcels of Hoffman Estates are to the north of Sarah’s Grove as are the Highlands in Hoffman Estates. Note the other two wooded areas. 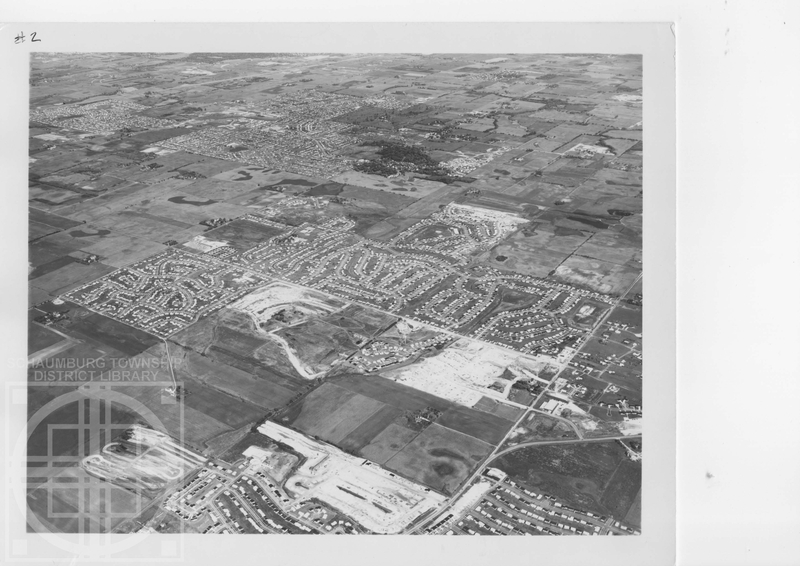 The portion to the upper left is the Walnut Grove portion of Hoffman Estates between Higgins and the Tollway. 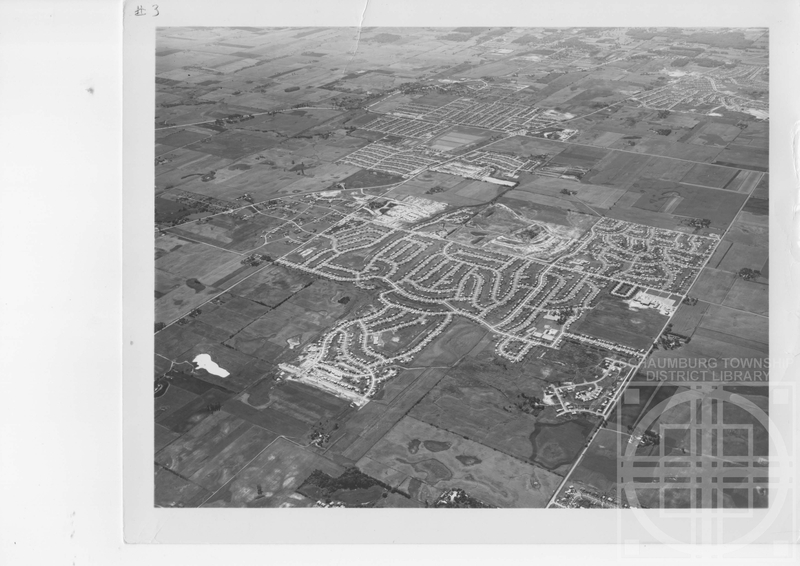 The portion in the upper center is Highland Grove in Hoffman Estates, north of the Tollway. It is now the Paul Douglas Forest Preserve. The view of this photo is looking northeast towards the Weathersfield subdivision in the center. Springinsguth runs through the subdivision with the “W” section nicely built out on the west (left) side of the road. Clearly, development is very much happening on various sides. The Hanover Highlands subdivision is also under construction in the southern part of the photo. Sarah’s Grove and Timbercrest are visible in the upper central portion of the photo with development just beginning. 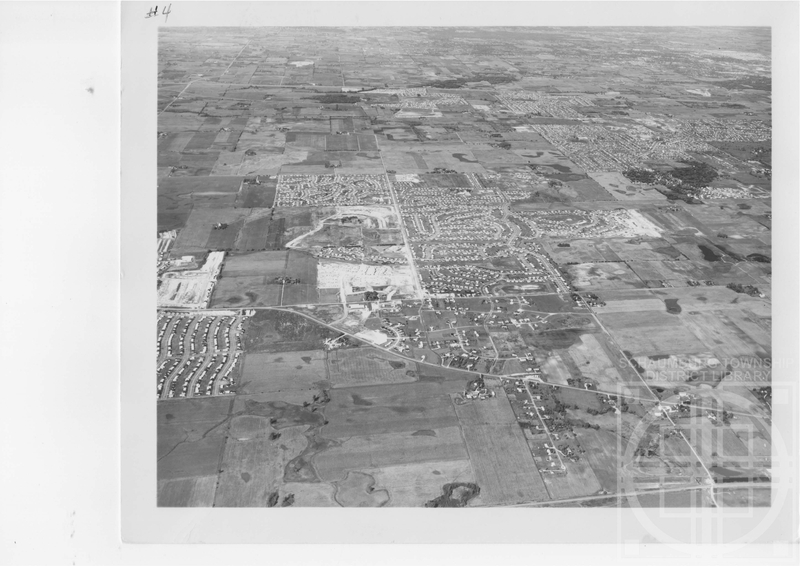 The Parcels of Hoffman Estates as well as the Highlands are in the top left of the photo. 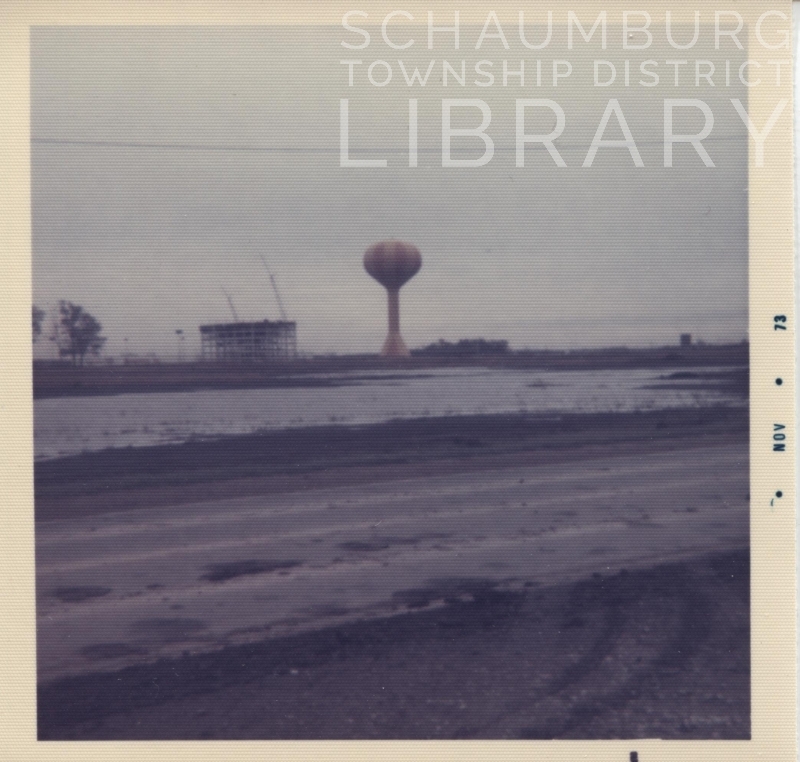 Looking at these photos, it’s clear how Schaumburg Township was developed in much of a jigsaw puzzle approach. Putting a piece here and then a piece there depended on when parcels became available from the farmers themselves or from the developers who had purchased the farms as an investment as the area begin to explode. People like Mr. Helsper, who served on the Zoning Board, Village Board and other commissions, definitely had their work cut out for them! *Many thanks to Tom Helsper, Matt Helsper’s son for passing on these photos. What a great resource! **These photos were used with the permission of UTC Aerospace Systems. This marvelous little ad was found by an original resident of the Timbercrest subdivision in Schaumburg. A friend saw the value in it and passed it on to me for posterity’s sake. And what a neat little find it is. 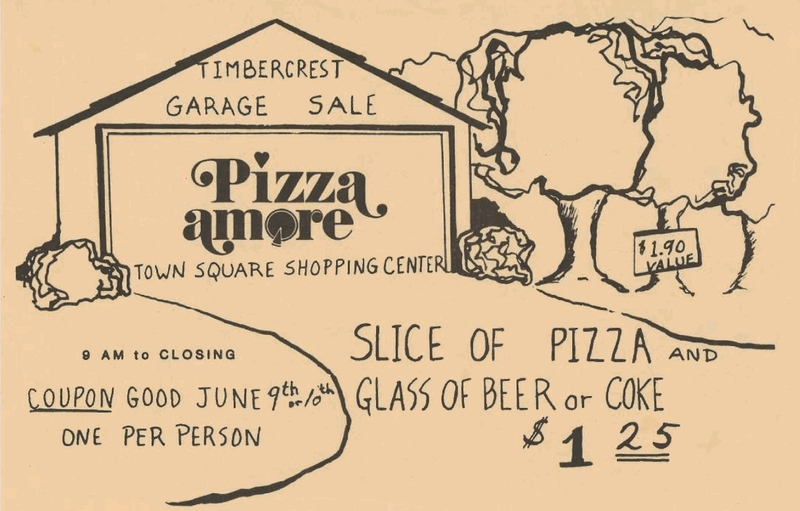 The coupon was obviously a promotional item celebrating the great Timbercrest/Woods garage sale that has been a yearly occurrence since 1970. In the first years, the sale was held in May. In a May 17, 1972 issue of the Daily Herald, it was mentioned that around 30 out of 365 homes joined the event in 1971. A week later in the May 23, 1972 issue of the Daily Herald, it was reported that around 40 homes had items for sale that year. Today, according to Rich Gerber, the organizer, there are between 100 and 160 homes that participate and the sale is now held the first week of June. For many years, the sale was held only on Saturday and Sunday. In 2009, organizers added Friday to the mix and it’s been that way ever since. As a result, around 5000 people annually weave their way through the streets looking for new treasures. Resident Carol Johnson ran the sale for nearly 30 years and when she stepped down in 2003, the annual event nearly ended. Jerry Thompson stepped in and took her place through 2006. Since 2007 the huge sale has been coordinated by Rich Gerber, another resident. His website provides information for this year’s sale. You can get to it HERE. The Timbercrest and The Woods subdivisions are reachable on Schaumburg Road, west of Town Square at Branchwood and Hilltop Drive. They are also reachable on Roselle Road, south of the Town Square Condominiums, at Beech Drive. Maybe you bought or sold treasures at the Timbercrest Garage Sale? Or took advantage of that coupon? If so, pass on the details. Everyone loves to hear about a great garage sale find! 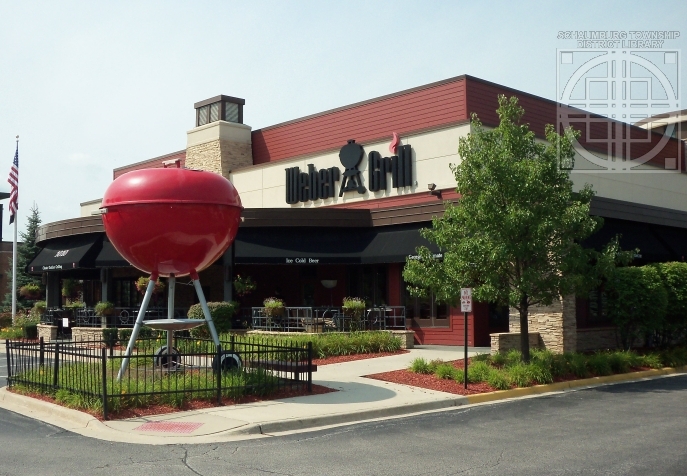 A SPACE NEEDLE IN SCHAUMBURG? 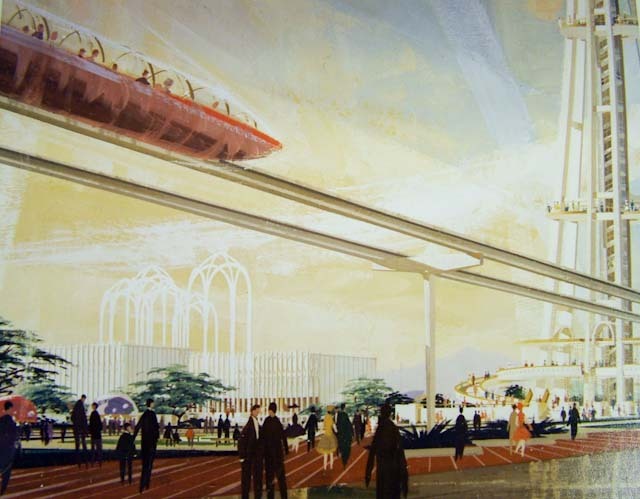 Most of us recognize Future World as a part of Epcot Center in Disney World, but it is a drop in the bucket compared to a futuristic development that was actually drawn up for Schaumburg Township in 1968. 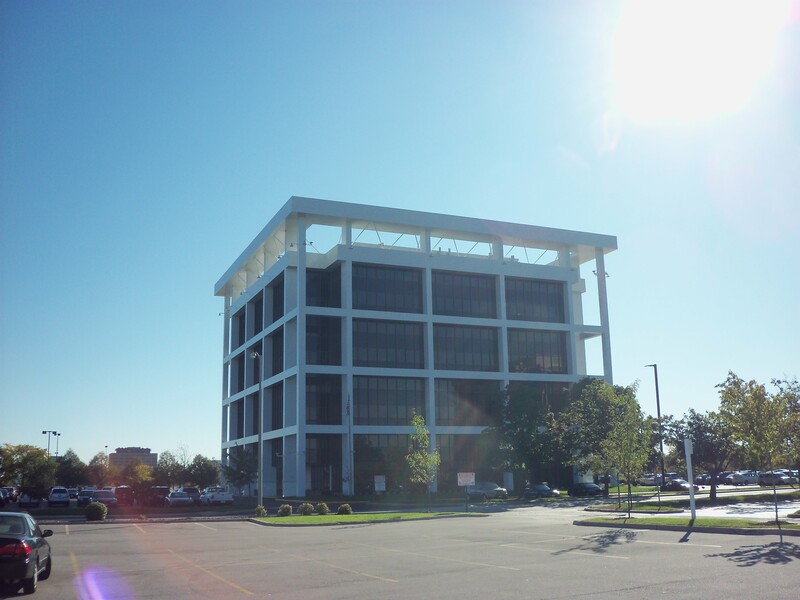 The plan was incorporated under the Schaumburg Planet Corp. and was the vision of its president, Lee N. Romano. 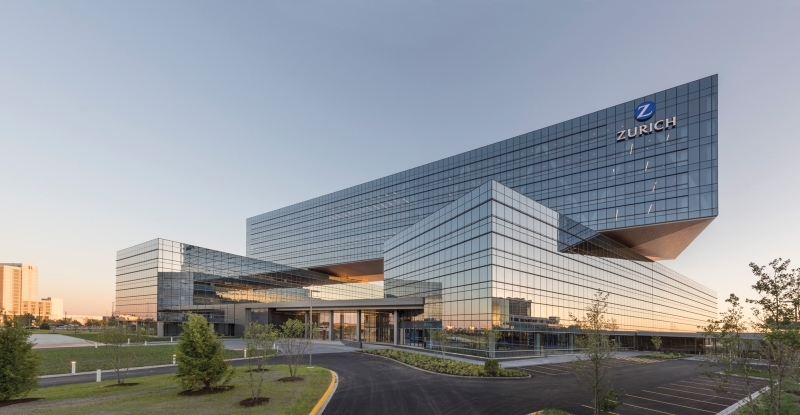 A local architect and developer, Mr. Romano, approached the Village of Schaumburg with a development called Outer Planets. The plan was scheduled to include the world’s tallest office building, a 65-story motor inn, 4000 apartments in various buildings and a 7-floor department store. Approximately 20,000 to 25,000 people would work there and the apartment units would house 8000 to 9000 residents. Moving sidewalks and horizontal escalators would carry people within “this exciting city of the future.” One of the unique aspects of this plan was the fact that it would be built on top of an underground platform that consisted of levels for parking to accommodate 40,000 cars, utilities, transit systems and other service facilities! It was to be developed to the tune of $150 million on a 238-acre parcel on the southwest corner of Higgins Road and Route 53. 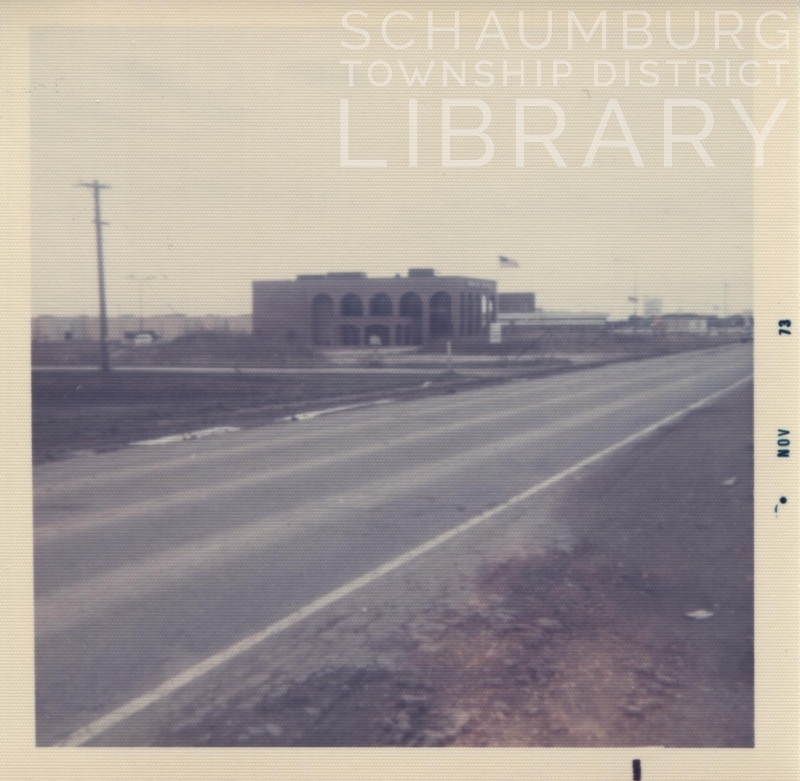 “I feel Schaumburg will be the hub of the future metropolis,” Mr. Romano stated at his meeting with the Zoning Board on July 10, 1968. 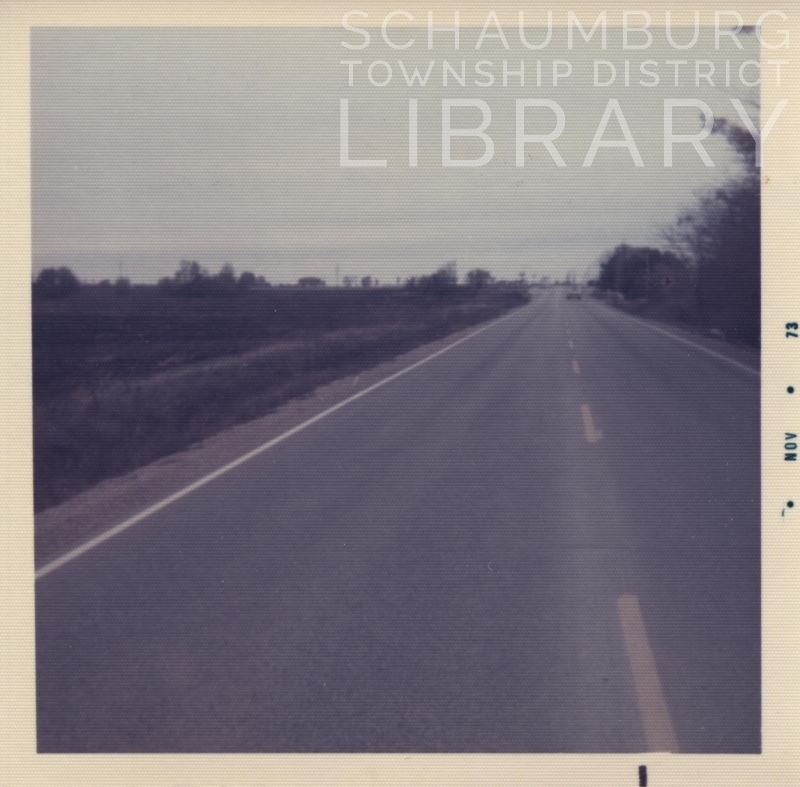 (Daily Herald, 7/12/1968) At the time this land was not part of the village of Schaumburg and annexation would have to occur before any development started. In addition, a 13-acre lake would be dug along the southwestern boundary between Schaumburg and Higgins Road for recreational and water retention purposes. Buried underneath the lake would be the total energy vaults of the concept. There were issues that needed to be resolved before annexation was approved. Nearby Lexington Fields residents were not happy about the nearness of the project and the disturbances it would bring as well as the future performance of their wells. They also requested that the plan include no supermarkets or discount stores. The village was also concerned with the future development of the highways nearby and how the project would be configured around them. This, of course, tied in with the village’s concern with the traffic this development would generate. 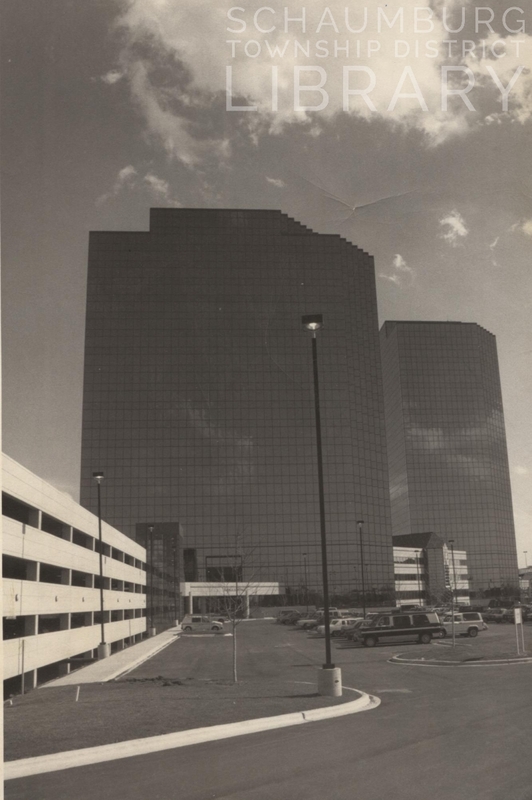 Development was supposed to begin with Phase 1 in 1969 with the construction of the 7-story apartment building, underground parking and the commercial area. The other phases would be built over a period of 10 years. His plan was upset, however, when the state needed 20 of his first 86 acres to connect Interstate 90 and Route 53. Those acres were eventually sold for $500,000 but caused the project to languish for a few years. 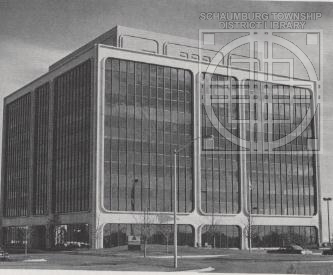 In fact, the project was removed from Schaumburg’s development plans in 1971 after no development activity occurred. He approached the village again in 1973 with another plan that added additional 66-acre and 74-acre parcels to the development and, again, zoning rights were granted. 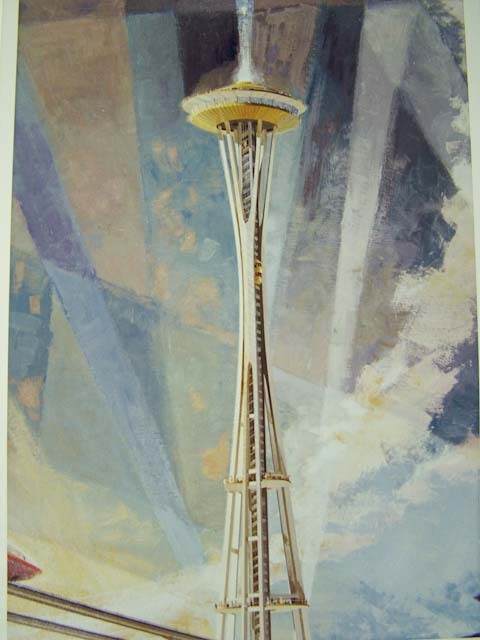 By this time the optimistic plan called for “a space needle, 30 buildings ranging from 22 to 70 stories, an 80-story hotel, a 126-story office and residential building and a ‘people mover.” (Daily Herald, 3/25/1976) The people mover would have been necessary too. The development was to house 70, 000 and employ another 30,000!